Keeping wild animals, even ones as tiny as field mice, is discouraged. But there are occasions whereby captive field mice need homes -- for example, if somebody inadvisably kept a couple of babies as pets and they later bred. Note that people inexperienced with small rodents should not attempt to keep undomesticated species such as the field mouse. Prepare a large mouse, hamster or rat cage much the same way you would for other small rodents. You'll include a thick, deep layer of paper-based bedding, as well as cardboard tubes and nest boxes, a water bottle -- and a water bowl in case the mice don’t use the bottle -- and a food bowl. Separate males from females immediately if the provider has not already done so. Place the males in a separate cage. Mice breed incredibly quickly, and you could end up with an awful lot more mice than you bargained for. Contact a local expert to identify the mice. Numerous species are commonly known as “field mice” in the United States and they all have different needs, in particular with regard to diet. Unless a rodent expert is on staff, chances are the provider of the mouse doesn’t know what gender your mouse is. To find such an expert, try asking your vet, wildlife center or university extension program. Try to identify the mice yourself in lieu of expert advice. Locate a list of local rodent species online. Look up images of each species and compare them to your mice until you think you have found a match. Note in particular the length of each mouse, the shape of the face and the relative length of the tail. 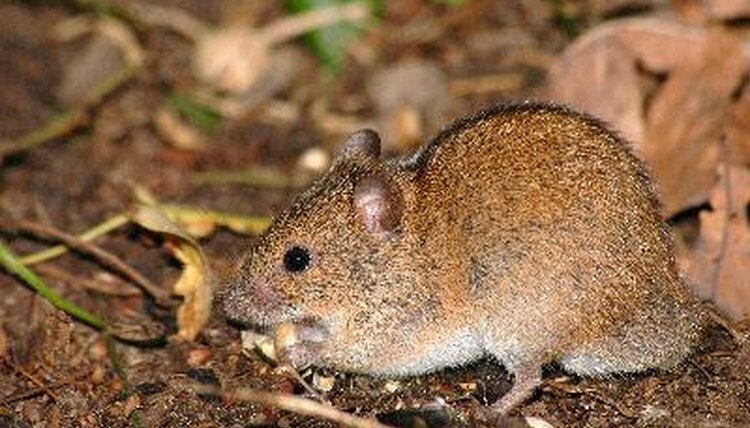 For example, a field “mouse” with a short furry tail and a blunt face probably isn’t a mouse at all -- he is most likely one of the many species of vole. Provide a mixture of foods, including whatever the provider was feeding the mice. Many wild mice are, like pet ones, omnivores; they eat a range of animal and plant foods. Other wild mice eat more specialized diets. If you don’t yet know what species the mice are, provide a muesli-style mouse mixture, pieces of fresh fruit and vegetables, hay and some fresh grass if available. You can also try a little cat or dog food. Once the mice are identified, provide a diet as close to that which they’d eat in the wild as you can. Care for the mice in much the same way as you might care for standard pet mice, including changing the water and removing soiled bedding and stale food every day. Clean out the cage once or twice a week.  This is intended as a simple introduction, not a detailed guide to field mouse care. Once you know which species you have, you can work out an appropriate diet from reading up on the natural history of the species.  Always wash your hands before and after handling the mice, cleaning them out or feeding them. This helps prevent infections being transferred between you and the mice.  If your mice are constantly fighting -- especially common among adult male mice of many species -- you’ll need to separate them into individual cages. Preowned hamster cages are widely available if cost is an issue. Why is My Mouse Losing Hair Around the Eye & Nose? What Do Mice Eat in Nature?